Dahon Bikes is gearing up to launch an innovative bike-share program that will offer riders an opportunity to borrow a bike that will not only aid in their commute but also fit into tight spaces, like crowded buses and trains, or indoors should one not have a lock to secure it. The Dahon Dock-In Stations Bike Share program is facilitated through a partnership with Best Lockers, effectively joining the worldwide leader in folding bikes with the leader in on-the-go storage technology. 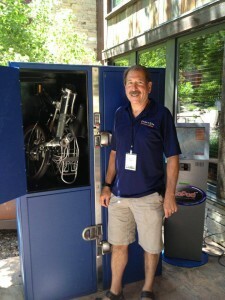 Best Lockers’ electronic GoPod lockers, developed in 2009, will make it possible for hotels, universities, city transportation and other organizations to offer more bikes while utilizing less space. According to Fagut, when the program launches this fall riders will be able to reserve one of Dahon’s Vitesse D7HG bikes either at a kiosk on-site or online. The Vitesse, outfitted with a seven-speed Shimano Nexus internal hub and lightweight alloy frame, can be folded and in under a minute, shrinking from riding shape and size down to 11.3” x 31.2” x 25.7”. After use, riders will be able to return the bicycle to any empty locker. Ken Fagut, Dahon’s North America Director of Sales and Marketing, said when the program launches this fall, riders will be able to reserve a bike at a special kiosk or using their smart phone and computer. They will receive a special access code to open the Best Lockers’ electronic locker, containing a Dahon Vitesse D7HG. After completing their ride, the bikes can be returned to any empty bike locker. For more information visit www.usa.dahonbikes.com.